Heat Pump Hot Water System uses industry-leading technology found in refrigeration and air conditioning units, where energy is drawn in from the ambient atmosphere and transferred into heat. An Ozone friendly refrigerant R744 (CO2) absorbs the heat, which then flows into a compressor where it’s converted into a high-temperature gas. Then, it passes through a conden-ser within the water tank and the water is heated up. A Heat Pump System can allow you to save dramatically on your conven-tional electric storage hot water bills. The result is a system that requires radically less electricity to heat water when compared to conventional hot water systems. 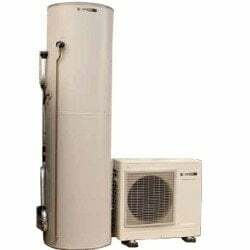 Most heat pump system are eligible for STC Rebate. A storage tank should hold a one day’s supply of hot water, the Heat pump storage tanks come in 160, 250, 270 and 315 litre. For help with selection please contact our free call number 1800 689 919 or you can simple fill in the quick quote form and we will be in touch within 1-2 hours (within business trading hours). Sanden heat pump hot water systems come 250 and 315 litre storage tank . The unit features a whisper quiet operation. Sanden back their products with a long term warranty with up to 15 years. EvoHeat heat pump hot water systems come in 270 litre storage tank. 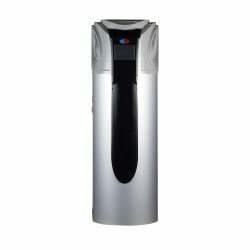 The unit is compact in size, yet powerful enough to supply hot water for up to six people in a household. For further peace of mind EvoHeat offer a 5-year warranty on the Evo270 Series tank, 2 years on parts and 1 year on site labour. The Australian Government lists solar water heaters that are eligible for STCs and are therefore eligible to receive a rebate based on the number of STCs awarded. An STC is a calculation of how much energy is expected to be saved over ten years when using a solar water heater compared to the electricity consumption of an equivalent electric water heater. 1 x STC is 1 x MWh of electricity saved over 10 years = 100 kWh saved in a year. Performance calculations take into account geographic location, solar radiation, the angle of the sun, the efficiency of the solar collector, tank heat loss, cold water temperatures, the quantity of hot water used and hot water usage patterns. The more STCs awarded to a system equate to a higher rebate available on the purchase of that system.